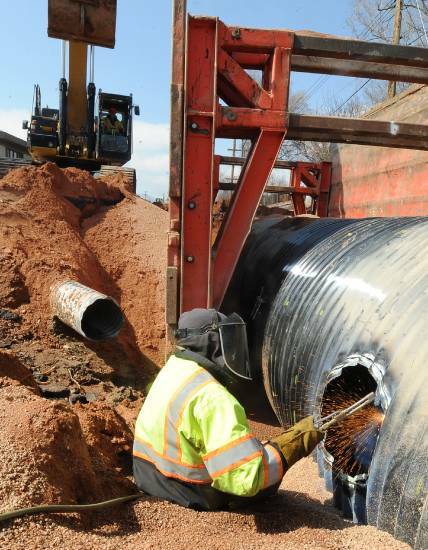 Installation of water drainage pipe in Colorado Springs. Photo by Colorado Springs Gazette. 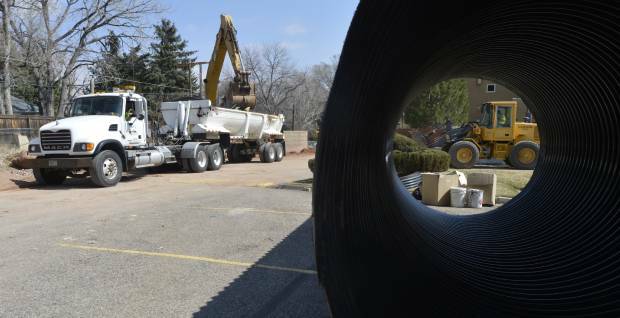 The city of Colorado Springs has recently completed two major drainage control projects to help with storm water drainage and flood mitigation. These projects are located near North Douglas Creek and Camp Creek and they are basins designed to remove and collect sediment from storm water. The purpose of these basins is to help protect Colorado Springs and its residents from water damage during heavy storms and mitigate the potential for flooding. If your home or business should sustain flooding or water damage, contact a reliable water damage restoration expert in Colorado Springs immediately. The new drainage control basins are strategically placed in Colorado Springs to offer the most protection to the city and its residents. The Douglas Creek basin is on the Flying W Ranch property and it captures debris flowing in the North Douglas Creek. After each storm, the Streets Division removes the sediment from this cleanable basin. The other drainage control basin is a temporary cleanable basin installed on the north side of Garden of the Gods Park. This basin will collect sediment coming into Camp Creek from the Waldo Canyon burn area. The goal of these basins is to help prevent flooding from these creeks during a storm. Flooding and heavy storms are a major cause of water and storm damage to homes in the Colorado Springs area. The completion of these basins will help mitigate the potential for flooding in the area but residents should still take necessary precautions and preventative actions against flooding and water damage. As soon as you discover water damage, you should contact a trusted water damage restoration professional because ignoring the problem can lead to further damage and even mold growth. Water damage restoration companies have the proper training and equipment to remove excess water and moisture form your home and restore the damage it caused. While these new basins will certainly help reduce the risk of flooding in Colorado Springs, your home can still become flooded for a number of reasons that the basins do not protect against. It is important for you to take preventative actions to help protect yourself and your home from floods. Assess the Risk: The first step to preparing your home for a flood is assessing the risk of flooding. Homes that are close to bodies of water or built on a predetermined flood plain are more likely to experience flooding. If flooding is expected in your area, make sure to take the necessary precautions. Review Insurance Policy: Standard homeowner’s insurance policies only cover some types of water damage and anything that is considered flood damage can only be covered with flood insurance that must be purchased separately. It helps to be familiar with the terms of your policy. Gather Supplies: In case a flood should force you to evacuate, it is beneficial to have an emergency supply kit ready. This kit should have important items such as food, water, a flashlight, first aid kit, medication, necessary personal documents, and keys to help you through the ordeal. Create a Plan: Evacuation is a real possibility during a flood so it is important to have an evacuation plan in case you are forced to leave. Make sure every member of your family is aware of the plan and establish a communication plan as well to stay in contact with each other after the evacuation. Find Higher Ground: Putting your most valuable items on your upper floors will keep them protected in cases of flash floods. You should also have a high ground spot in mind for yourself if forced to evacuate. Watch the News: If there is flooding in the area, tune into the news to stay updated on storm or flood watches and warnings. Cut off Utilities: It is best to shut off your gas, electric, and water in cases of severe flooding before evacuating your home. The city of Colorado Springs has taken an important step in protecting their residents from potential flooding but it is still up to each individual homeowner to make sure that their home and family are prepared. Follow these tips if flooding is imminent in Colorado Springs and if your home should suffer water or flood damage, contact a local water damage restoration service provider immediately.